Originally written for the most recent Los Angeles Bicycle Coalition zine. The best things about Los Angeles are hidden. When I first moved here 6 years ago I was fortunate enough to be introduced to the city by bicycle, which in my opinion has always been the best way to find what you least expect in a city. I explored neighborhoods and back streets and all that comes with being where most people from outside never see. The crisp air and great smells on the quiet streets of Hancock Park to the late-night food vendors on the busy streets of MacArthur Park. I grew up going to NYC often and was told that if I loved NYC I would hate LA. I’m not blind to what there is to dislike in this city, but I quickly learned that if you make it your own, there is plenty to love. I don’t think I would of had these experiences if it wasn’t for my bicycle. Unlike NYC, here we have unbelievable, accessible, wild protected areas within cycling distance. Central Park is pretty cool, but Griffith Park and its howling coyotes and miles of cycling roads is unbelievable. But Griffith is just the beginning. I’m no cyclocross racer, but for many years I’ve ridden a touring/cyclocross bike in the city. 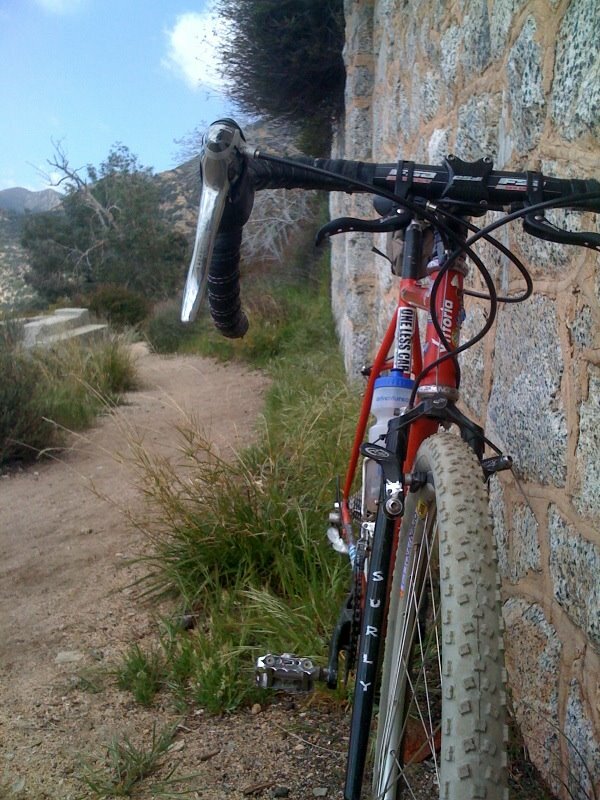 It took some time, but I eventually got some knobbie tires and began to explore off-road in the San Gabriel and Santa Monica mountains with the same vigor and thirst for exploration that I originally approached the urban landscape with. And the results were similar. There are many miles of fire roads accessible by bicycle out of your front door here in Los Angeles. Within a few hours I can be a few thousand feet above the city with only nature, some animals and an occasional hiker or cyclist to distract me. Last weekend I did a loop to the top of Mt Wilson from near the Rose Bowl almost entirely on dirt and saw only a handful of people. Even after 25 years of riding a bike, I’m still amazed at the opportunities and beauty it presents. I agree – L.A. is is fantastic place to ride a bike. We have it all here – paved roads and dirt roads, urban areas and wilderness areas, Hollywood Blvd. and Franklin Canyon, the Santa Monicas, San Gabriel Mountains, the San Bernardino Mountains, with deserts and pine-forested slopes not all that far away.